"An old favorite of my mother's." Preheat oven to 350 degrees F (175 degrees C). Grease muffing tins. Sift dry ingredients together, cut in butter with fork or pastry cutter. Beat egg, add milk and vanilla then stir quickly into dry mixture. Roll out on well floured surface to about 1/4 inch thickness and cut with round cookie cutter. 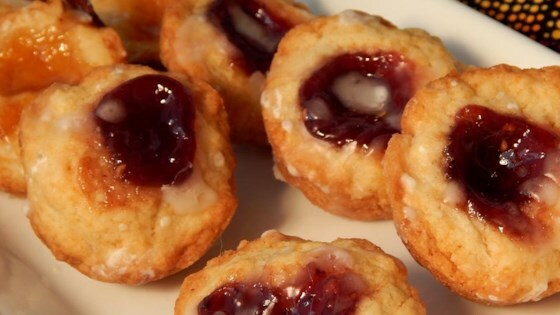 Place in muffin tins and drop a teaspoon of raspberry jam in center. Fold sides in slightly and bake for 20-25 minutes or until lightly golden. These sweet treats are perfect for Valentine’s Day! This was a nice surprise. It was easy to make and the cookies were very flaky and buttery.